It really bums me out that this series is getting canceled this summer, but I’m going to enjoy what’s left of this series. The fifth issue of Hawk and Dove finishes up the first story arc with a conclusion to their feud with the villainous Condor. Obviously they succeed and Deadman survives; there is an issue six you know. But the best part of the story was the relationship between Hawk and Dove. Obviously, they don’t like each other that much. But they do care about each other. Dove gets mad at him when he suggests that being in a relationship with Deadman might not be the healthiest thing for her. We’ve all been in that situation where we’ve had to tell a friend that, or heard that from someone else. The book ends with Hawk being right, well sort of. Deadman dumps Dove because he feels he’s a threat to her safety. Poor Dove. As you know, I’ve really been enjoying this series. Sterling Gates’ story has been fun and Rob Liefeld’s art has been bombastic as ever. Next issue sees Liefeld taking complete control of the book, and we get a visit from Batman. Sounds like fun. 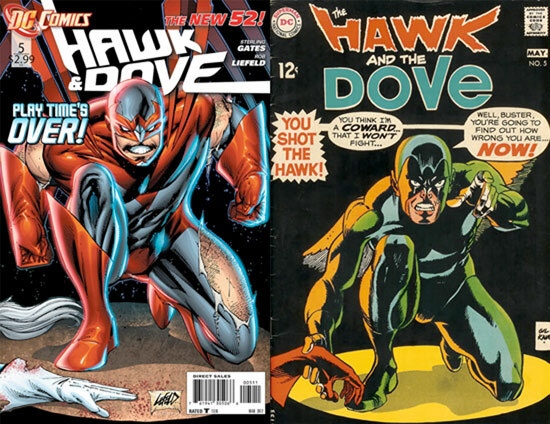 Oh, and check out Liefeld’s homage to the original Hawk and the Dove #5 cover by Gil Kane! This entry was posted in Uncategorized and tagged hawk and dove, hawk and the dove, rob liefeld by Chris. Bookmark the permalink.